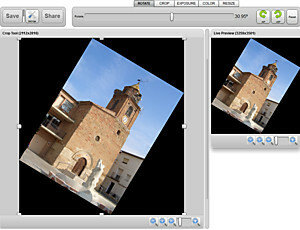 The photo rotator in goDromo Photo Editor allows you turn any photo or picture any arbitrary number of degrees offering you a realtime preview of the results. Imagine for example you just scanned a photo and it’s slightly tilted to the right or the left. Our photo rotator is the perfect tool to straighten it out and it also allows you to perform some other modifications like cropping with the Crop Tool or Resizing it.